When African slaves were imported to America, they were taught Christianity, but some people continued to hold their traditional faiths. The result was a blending of traditional West African beliefs with Christianity. Today, many Afro-American folk religions continue to be practiced in the Caribbean, particularly among the poor and less educated people. 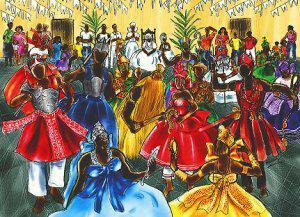 They include Voodoo in Haiti, Santeria in Cuba, Shango in Trinidad, and Kuminia or Pocomania in Jamaica. The Afro-American folk religions emphasize magical practices designed to bring good luck to their devotees or harm to their enemies. Ceremonies often include the ritual sacrifice of animals. The religions worship the spirits of the dead, but the spirits given the names of Christian saints. This blending of beliefs allowed the Africans to retain their native faith while appearing to convert to Christianity. The folk religions also provide an additional function, particularly in the remote sections of Haiti. Many practitioners of the religions are able to use tropical plants to relieve pain and cure illnesses. This is the only medical care available to some people. Many people of the Caribbean profess to be Christians but feel comfortable with the rituals of the folk religions. In 1998, Pope John Paul II visited Cuba, where he urged Catholics to reject the practice of Santeria. In addition to the Caribbean, the folk religions are also practiced in American cities with large Caribbean populations. They include New Orleans, Miami, New York City, and Los Angeles. This painting depicts many of the primary Orisha of Santeria. An Orisha is a spirit or deity in many Afro-American folk religions. In Santeria, the Orishas are creator’s eldest children. They are responsible for watching over humanity and each has authority over a aspect of nature. 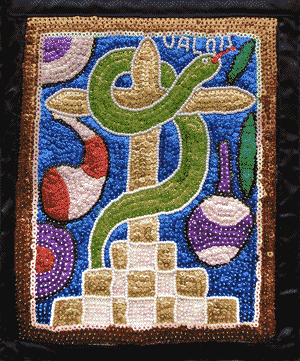 Constructed of sequins and beads hand-sewn onto fabric, drapo depicts Haitian folklore and Voodoo practices. Voodoo is a blend of African and Christian religious practices that evolved in Haiti through generations of slavery.